Orlando, Florida is one of the best travel destinations for families. I have been a proud resident of Central Florida for over twenty years and enjoy experiencing all of the attractions with my own family. Wet ‘N Wild is a premiere water park with tons of thrill rides and it was a favorite destination when I was in college. I will admit that I haven’t visited the park in years primarily because my children are so young that I didn’t think they could ride any of the water slides or enjoy the other attractions until they were older. Therefore, I was very excited to learn that Wet ‘n Wild has opened the new Blastaway Beach which was designed specifically for families with young children. 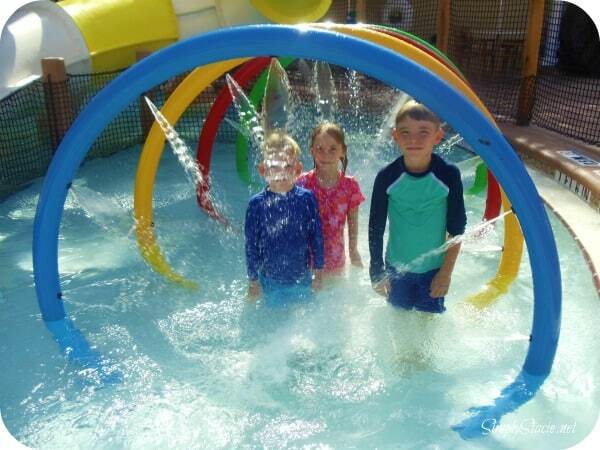 That was enough for our family to don our swimsuits and head over to Wet ‘n Wild for a fun-filled day in the water. We were extremely impressed with Blastaway Beach which features a 60 foot high simulated Sandcastle! 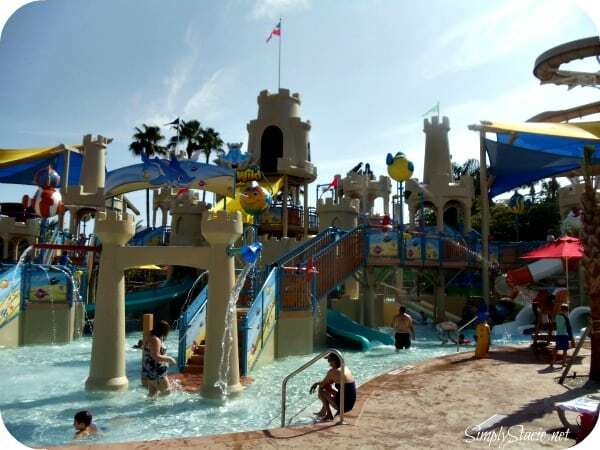 Situated on just over an acre, Blastaway Beach is considered “the largest water playground of its kind in Florida” and it is absolutely amazing! There are 15 slides, 160 soakers, jets, waterfalls and water cannons across two shallow entry pools. My children’s eyes grew wide with excitement the moment they saw Blastaway Beach upon entering the park and they squealed with excitement describing it as “the most amazing thing we have ever seen”. Even my husband and I were eager to get in on the fun and join the kids by sliding, splashing and dropping water on unsuspecting fun-goers below. My children are ages 4, 5 and 7 and even though they are all swimmers I was very relieved to see that there are so many lifeguards on duty and they were extremely attentive and strategically placed all around Blastaway Beach. There is also the option for the children to wear life vests (provided free of charge) and since we were trying to keep track of all three kids we decided to have them wear it as an additional safety precaution even though they can swim and the water is quite shallow. My four year old son thought it was a blast to have a huge gush of water fall on him as he eagerly waited for it to drop from the top of Blastaway Beach. 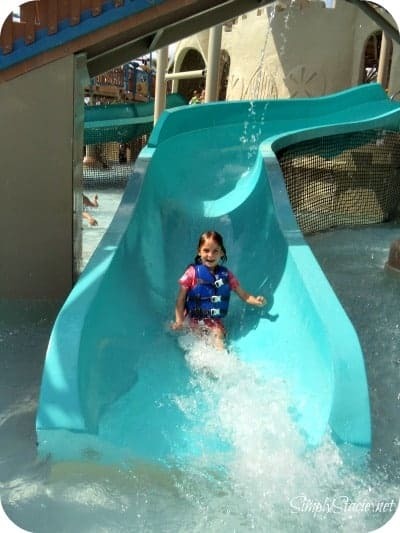 My five year old daughter and seven year old son couldn’t get enough of the water slides which even the adults can enjoy with the kids. There were lots of lounge chairs for adults to relax and even a covered shaded area with tables and chairs. I was originally worried about leaving my camera equipment unattended while enjoying the rides but quickly discovered that there are affordable lockers for rent and even small lockers attached to the tables which I used to safely secure my valuables. I was also very surprised to learn that since my last visit, Wet ‘n Wild has lots of multi-person rides that can be enjoyed by the entire family. With height restrictions of 36” or 48” inches, there are lots of things for all of us to ride together. Our favorites include the Bubba Tub, The Surge and The Flyer. My husband even braved Bomb Bay which is a heart-pounding capsule where the floor literally drops out from under your feet as the rider is plunged 76-feet almost vertically down a slide (I wasn’t so brave). When we got tired we floated around the Lazy River which is my personal favorite. Once we had regenerated our energy with a relaxing float and some delicious food at Riverside BBQ we were ready to hit the Wave Pool (another family favorite). I also want to mention that I was pleasantly surprised that Wet ‘n Wild allows coolers in the park (please read what you are not allowed to bring before heading out). We were at the park the entire day so we were able to save money by bringing our own water and healthy snacks and then we could afford a nice dinner at the BBQ restaurant on the property……..a great option for budget conscious families like us! 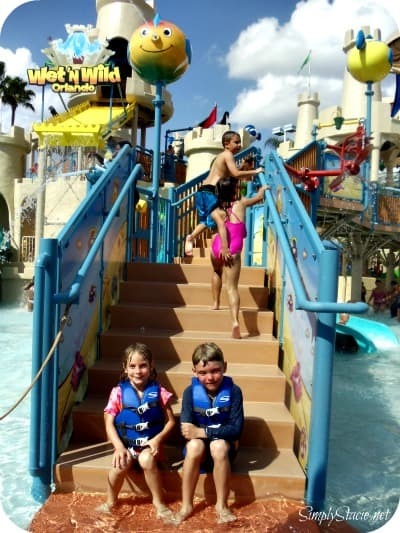 Wet ‘n Wild is an affordable attraction for the entire family that really hits the mark with the addition of Blastaway Beach. In fact, we were so impressed during our visit that we are going to get annual passes for the entire family. This is very affordable because Wet ‘n Wild currently has a promotion for Florida residents where you can “Buy a day and get the rest of the year FREE”. There are lots of other great specials for both residents and tourists so you are sure to find the perfect rate for your next visit to Wet ‘n Wild. It is at the top of my list for “must-visit” attractions in Central Florida. You are invited to visit the Wet ‘n Wild website to check out all of the fun attractions and have a “blast” planning your next visit to Blastaway Beach. Connect with Wet ‘n Wild Orlando on Facebook & Twitter. Disclosure: I was not financially compensated for this post. I received a free pass for my family for review purposes. The opinions are my own, based on my personal experience.